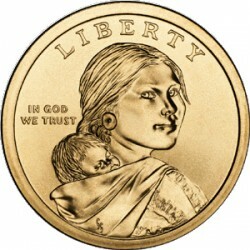 For almost 200 years the United States Mint had struck coins featuring Native Americans on U.S. coins. It is an irony that at the time when this government was engaged in the forcible removal and whole sale slaughter of the Native Americans it had put portraits of Native Americans on this nation’s coinage. Almost 200 years later some of the Native American tribes are now exercising their tribal sovereignty by issuing their own money. Three tribes have issued their own coinage—the Poarch Creeks, the Shawnee, and recently the Los Coyotes. The Poarch Creeks are the last remaining Creeks in the State of Alabama. These are among the last of the Creek Confederation who fought on the side of the United States so they were never forcibly removed. Today they exercise their own self-government, have their own laws and legal system (and courts), and their own flag. They have gone one step further by issuing their own coins. The Poarch Creek dollars are legal tender currency, but are sold to collectors to raise revenue for the tribe. The same is true of the Shawnee. The Shawnee, like the Creek, were once a Native America people found in the eastern part of the United States. They were forcibly removed to Oklahoma where they remain. The Shawnee tribe has issued their own coins depicting important heroes from their past as well as some non-Shawnee historical figures like former U.S. President Thomas Jefferson (apparently they have a good opinion of him). Like the Poarch Creek tribe, all Shawnee tribe coins depict the tribal emblem much as almost all U.S. coins depict the American eagle. The Los Coyotes are a Native American tribe north of San Diego in California. With only 300 members (only 78 of which live on the reservation) they do not have much in the way of resources. They tried to set up a casino, but strangely enough they were prevented from doing so by other Native American tribes who did not want competition. Hence, the Los Coyotes have issued their own coins to help raise revenues. The Los Coyotes coins are in denominations of one cent, five cents, ten cents, twenty-five cents, fifty cents and one dollar. The symbol of the Los Coyotes coins are two coyotes and an eagle. In an effort to help out the Native Americans, I highly recommend for all those who collect coins to look into Poarch Creek, Shawnee and Los Coyotes coins. They can be found at the websites www.pandaamerica.com and www.joelscoins.com.